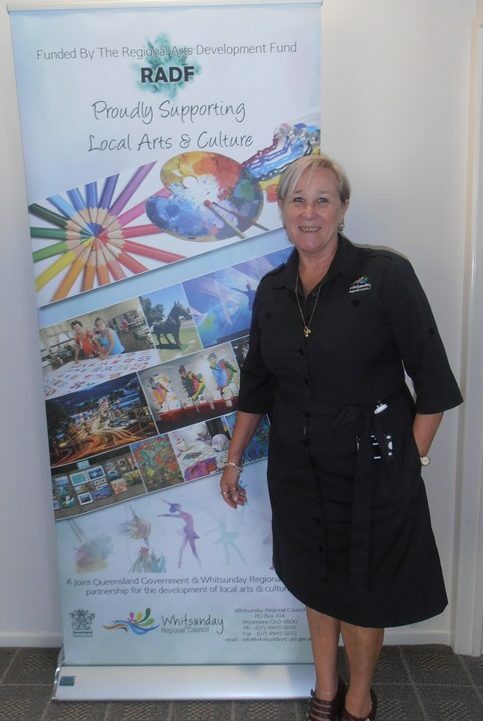 Jacqui, the Arts and Culture Officer – RADF Liaison Officer gave a very interesting presentation regarding what Art and Cultural projects a RADF Grant can be used for. I was very grateful that I was awarded a RADF Grant that assisted me to travel to Ireland in June/July/August 2015 to attend the UCC Genealogy Summer School, the Archives visit to Dublin and the 1798 Re-enactment in Enniscorthy, Wexford Ireland. We enjoyed a very successful “Who do you think you are” presentation and Workshop at the Whitsunday Regional Council, Cannonvale Library on 17 August, 2016. I was delighted that 3 members of the Whitsunday Family History Group came along to assist. Thank you Linda, Elizabeth and Neil. 5 members of the Bowen Family History group drove to Cannonvale for the Workshop. 20 other interested novice Genealogists participated and judging from the feed back we received, learned a lot from the Workshop. During this Workshop the Enniscorthy DVD that Barry made featuring my photos and narration was shown. Each Participant was given a Pedigree sheet and a family group sheet amongst other hand outs. An overview of what important Records to locate and keep was explained. Later a hands-on session of participants using the Library edition of “Ancestry.com” on the Computer was appreciated by many attendees who had never used this programme previously. WORKSHOP 2 – How to trace and commence recording your family tree. The Beginners Workshop held on 21 September, 2016 introduced novice Genealogists to important Records and web sites to research their Ancestors. Participants were able to locate Forbears in the UK, Ireland and Europe. One participant was delighted to find the details of her Grandmother,an Indigenous lady who was fostered during the period in Australia known at the “Lost Generation”. Most of the beginners were able to report that they had found lost relatives. It was a very rewarding Workshop. 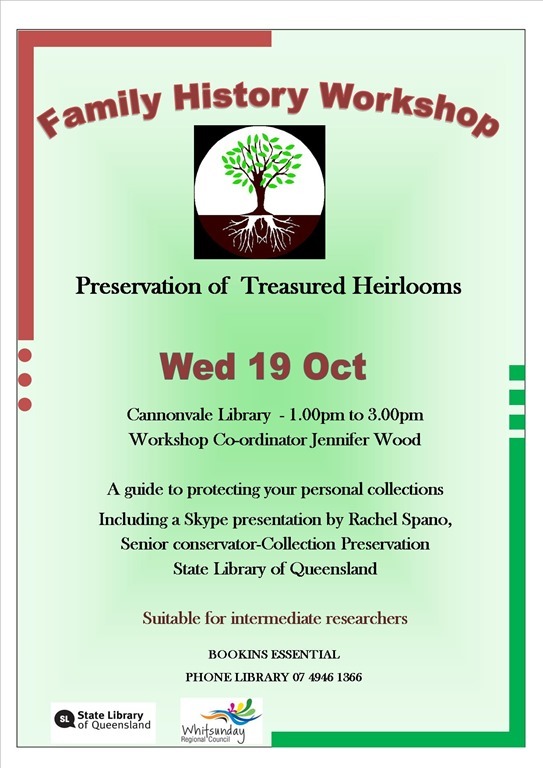 WORKSHOP 3 – Preservation of treasured Heirlooms – a guide to protecting your personal collections. 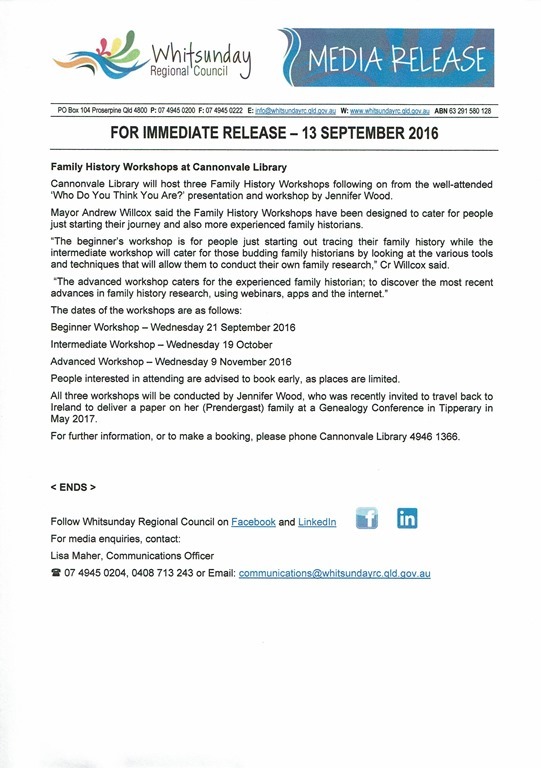 We held our third Workshop at Whitsunday Regional Council Cannonvale Library on Wednesday 19 October, 2016. During this Workshop we featured a Skype with Rachel Spano, the Senior Conservator of the State Library of Queensland, who advised one-on-one about Preservation, Conservation and Restoration with a Q & A following. We learned how to prevent Mould from damaging our personal Collections by constant monitoring of temperature, no hotter than 26 degrees and avoiding humidity. Rachel also outlined the various storage boxes to us to help conquer the challenges of living in the Tropics. After the Skype, each participant constructed a “Four Flap Enclosure” to preserve their valuable documents. Thank you Whitsunday Regional Council for supplying some of the materials and equipment. 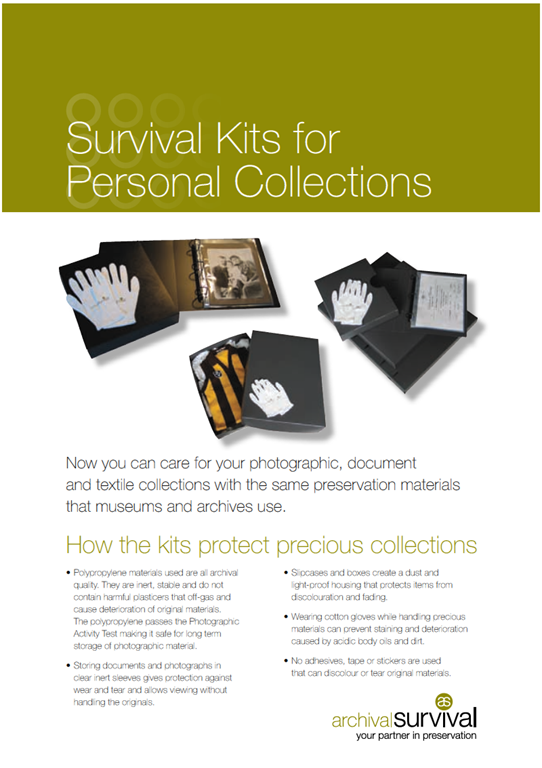 Thank you Archival Survival for supplying precious collections samples for the Workshop. And, Thank you to Rachel for delivering a very well received Skype Presentation that was voted by the participants as having exceeded their expectations! Proposed planning for Workshop 4 – Advanced Research for experienced Genealogists. This Workshop will include my report about the SAG Seminar that I am due to attend in Sydney on the Weekend of the 5th & 6th November.The Seminar will cover the latest information and Research techniques. I will also advise the strategies that I used to get the best out of my Repositories visits in Sydney. We will discuss the brick walls that we have encountered and by using the latest technology, how we can overcome these. 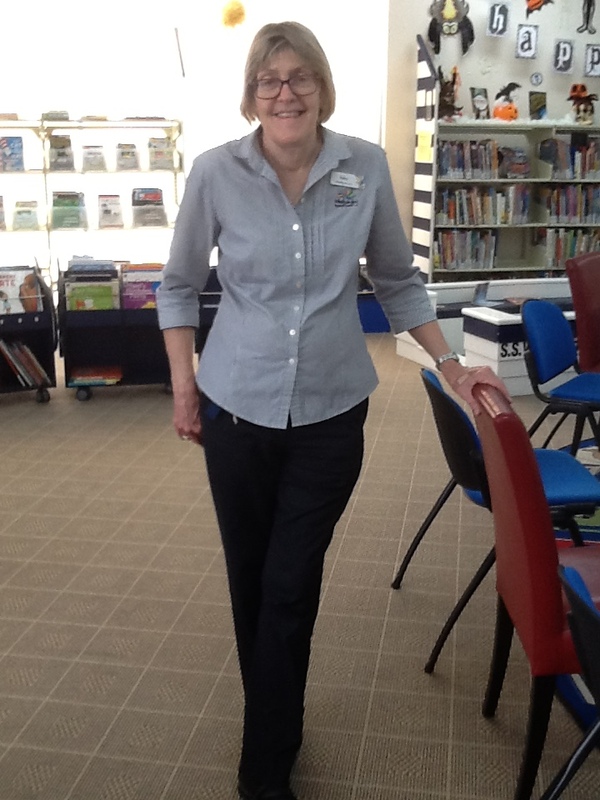 At the end of the Workshop, the participants will be invited to make suggestion of what topics they would like to have included in the Workshops that will be held next year at the Whitsunday Regional Council Cannonvale Library. I am delighted to be attending the Society of Australian Genealogists (SAG) Seminar “Lost in Immigration & Travel” in Sydney 5&6 November to be held at the Mitchell Library. To find out more about the Seminar please click on the link http://www.sag.org.au. I am looking forward to meeting up with my friend Christine at the SAG Seminar. We met when we were both attending the University College Cork Genealogy Summer school last year. It will be great to compare our Genealogy research notes over the past 12 months. During my visit to Sydney, I will be driving with my cousin Mark who is also the 5x Grand child of John Prendergast to Kingswood to visit the New South Wales State Records. There we will be privileged to view the original documents of John Prendergast. Sarah from NSW State Records rang today to ask me which Records I would like to see. I can’t begin to tell you how excited I am that I will be able to put my hands on (albeit wearing white gloves) documents that are over 200 years old and written or signed and sealed by my 5x Grandfather! Following the SAG Seminar, Cousin Mark and I will be visiting the Mitchell Library in the New South Wales State Library, Sydney where I have been invited to view the original documents of John Prendergast. These are items of their special collections and will be taken out of their Safe just for our visit. WORKSHOP 4 – Advanced Research for experienced Genealogists. We held out 4th Workshop of the series at the Whitsunday Regional Council’s Cannonvale Library on Wednesday 9th November, the day after my return from a very hectic but rewarding Repositories research trip and SAG Seminar in Sydney. With my head spinning from all the new discoveries that I had made at the State Records of NSW and the Mitchell Library, along with all the new information imparted to us at the SAG Seminar, I couldn’t wait to deliver a memorable Workshop. I decided that I would help break down the participants “Brick Walls”by shaking them out of their comfort zones. So many researchers who have been delving into their family histories over many years have set ideas about where their families came from, how they got here, what their lives were like and what sort of people they were. Today I decided that if the participants were going to be able to break down their “Brick walls” that like the participants at the SAG Seminar, we would have to think laterally, not have preconceived ideas. And we would have to be prepared to take a new tack. So, after the initial welcome and synopsis of the day’s Workshop content, instead of conducting a presentation, I started firing questions at them. What years did Queensland, South Australia,Tasmania and Victoria break away from NSW? Did they know that New Zealand was originally part of NSW? Did they know whether their Ancestors sailed as unassisted passengers to the colony or whether they arrived under an assisted immigrants scheme. What was the name of that scheme? Where did they first land in Australia. Did they settle there and then move on? Were they aware that our Ancestors were very mobile? What type of work did they do? What year was the first immigration Flight, not ship to Australia? What events occurred in their Ancestors lives. There were quite a few surprised looks. Then we adjourned to the Computer room where “Ancestry.com” was already set up for us. This time I asked the participants to click out of Ancestry.com because today we were going to explore other avenues for researching additional records using Repositories that led to the exact same sites. When I asked the attendees where their ancestors first lived in Australia and they all replied Queensland, they looked shocked when I asked each of them to go to various Computer sites that were NOT in Queensland. State Library of Victory, State Records of N.S.W, State Library of South Australia were just some that I chose for each participant to search for information. When one attendee clicked on the State Library of Queensland, I asked her to click on a link which she did and she was totally surprised when up came the National Archives (which she protested “but that is in London!”) I then showed her how to get into Records of Convicts in N.S.W. on this site. Later I showed the attendees Baptism Records of Ireland in another area of this site. What I was showing the participants was that World wide other Repositories hold records for Australia as do Australian Repositories for other countries. I also wanted the attendees to take off their blinkers and think more widely. By searching International and Australian resource sites such as the State/County Records offices, State/county and National Libraries as well as State/County and National Archives along with the very useful sites, Ancestry.com and Find my Past (amongst others) new discoveries would be made. In order to break down “Brick Walls” we have to embrace new technology and information and be prepared to keep an open mind when searching the on line, constantly changing resources of each Repository. If the opportunity arises, there is nothing quite like getting your hands on the original documents but it is important to follow the guide lines of each Repository for planning your visit to avoid being disappointed on your arrival. Next year I look forward to conducting a new series of Workshops at the Whitsunday Regional Council Libraries, writing a book on my Prendergast Ancestors here in Australia, accompanying a group of enthusiastic Genealogists to Ireland and presenting a paper on the Quest to find Prendergast family history in Ireland. In my travels I will delight in meeting more living Prendergast family members and revisiting the lovely Irish people who made my trip to Ireland so wonderful last year.